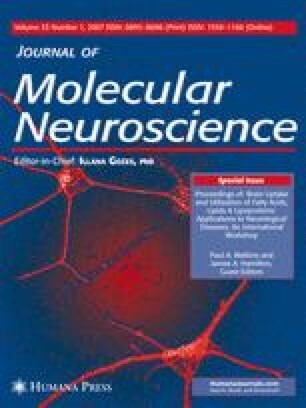 A key function of fatty acid (FA) transport into the brain is to supply polyunsaturated fatty acids (PUFA) that are not synthesized in brain cells but are essential signaling molecules and components of the phospholipid membrane. In addition, common dietary FAs such as palmitic acid are also rapidly taken up by the brain and esterified to phospholipids or oxidized to provide cellular energy. Most evidence shows that FA crossing the blood brain barrier (BBB) is derived mainly from FA/albumin complexes and, to a lesser extent, from circulating lipoproteins. Our model proposes that FA diffuse across the lipid bilayer of the BBB without specific transporters to reach brain cells. They cross the luminal and transluminal leaflets of the endothelial cells and the plasma membrane of neural cells by reversible flip-flop. Acyl-CoA synthetases trap FA by forming acyl-CoA, which cannot diffuse out of the cell. Selection of FA is controlled largely by enzymes in the pathways of intracellular metabolism, beginning with the acyl-CoA synthetase.